Attention Steam users! 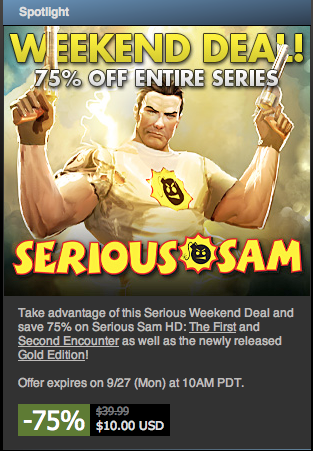 Every Serious Sam HD game is 75% off this weekend only. Unfortunately the titles haven’t been released to Mac users as of yet, making the deal exclusive to PC gamers. However, if you grab the PC version of the game during the sale, you will most likely get the Mac version for free, if and when its released, as this is Steam’s policy with all cross platform titles. You can grab Serious Sam HD: The First Encounter for just $3.74, Serious Sam HD: The Second Encounter for just $4.99, or both remakes in the Gold Edition for $10 (was $39.99).